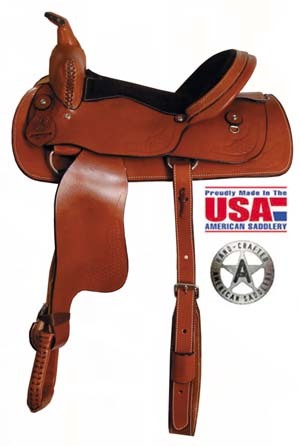 Pleasure : Pleasure Range Rider 14"
The American Saddlery Pleasure Ranger Rider is available in seat sizes 14”, 15”, 16”. Brown only with suede seat, tooling and border tooling. Horn: Leather Covered Height 3", Diameter 2"
Rigging: Double Stainless steel dee.